When you picture a cruise line’s private island, do you imagine an empty stretch of sand with rows of lounge chairs, and not much else? 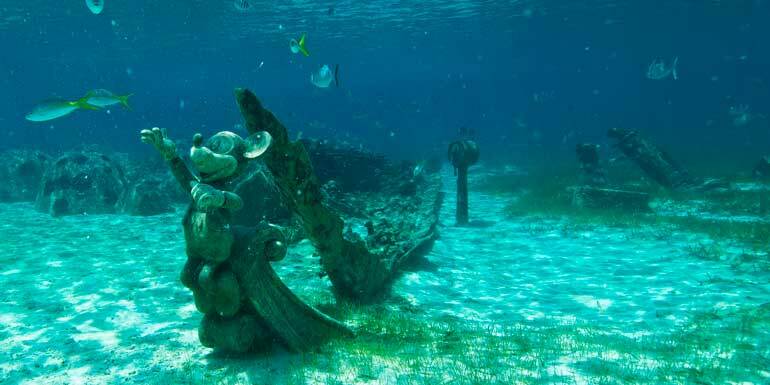 That’s certainly not the case on Disney's Castaway Cay. 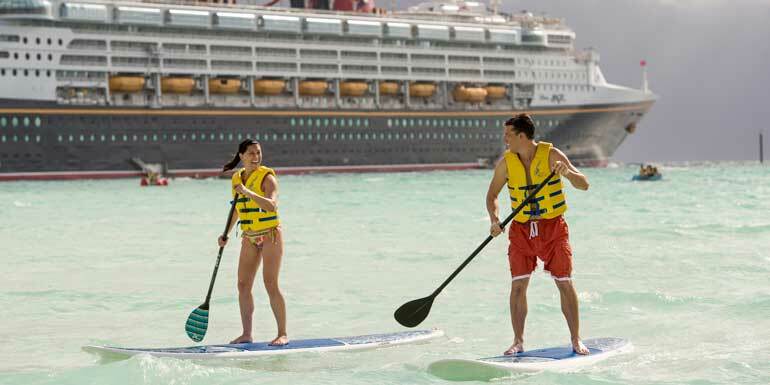 This is Disney Cruise Line, after all, so its version of a Bahamian island is just that: Its own. Picture a tram (what else?) 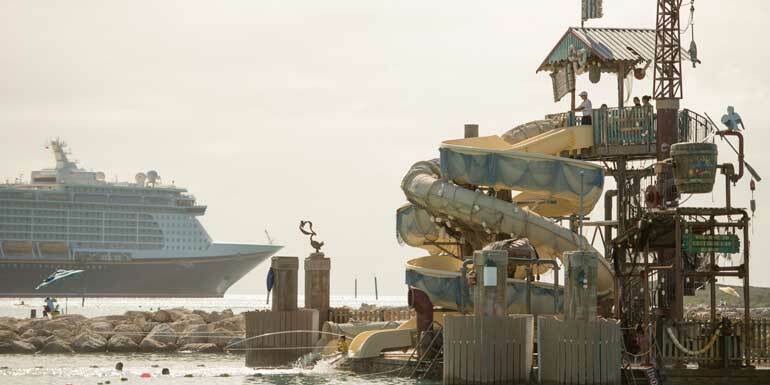 to take you from the ship to the three different areas, character visits, a giant three-story water slide designed to look like a castle, and even a sprinkler park for little kids. 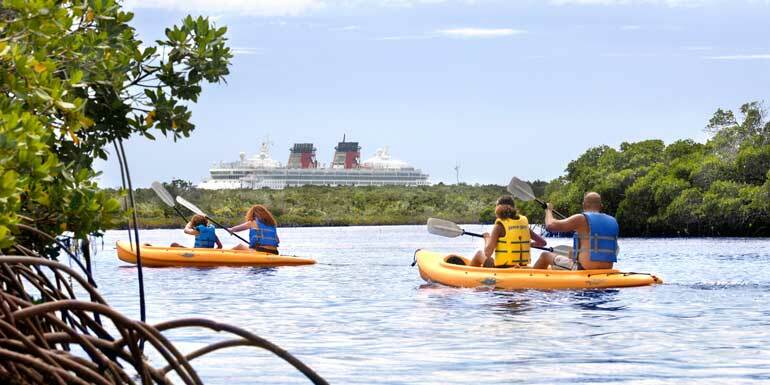 See how Disney brings the magic to Castaway Cay and what you can expect when visiting this one-of-a-kind privat island. Cookie’s BBQ and Cookie’s Too BBQ: These two buffet spots each have plenty of covered seating, with picnic tables and enough high chairs (in two different sizes) to go around. Look for grilled burgers and hot dogs, but also veggie burgers, fried chicken sandwiches, and pork ribs. Sides include corn on the cob, baked beans, coleslaw, and German potato salad — and there’s also a fruit bar, as well as soft serve ice cream and banana bread for dessert. At every restaurant on Castaway Cay, you’ll find a serve-yourself drink bar, with everything from soda and iced tea to coffee for the grown-ups and milk for the kids. Conched Out Bar, Heads Up Bar, Sand Bar, and Castaway Air Bar: These four beach bars all serve a mix of beer, cocktails, and frozen drinks. 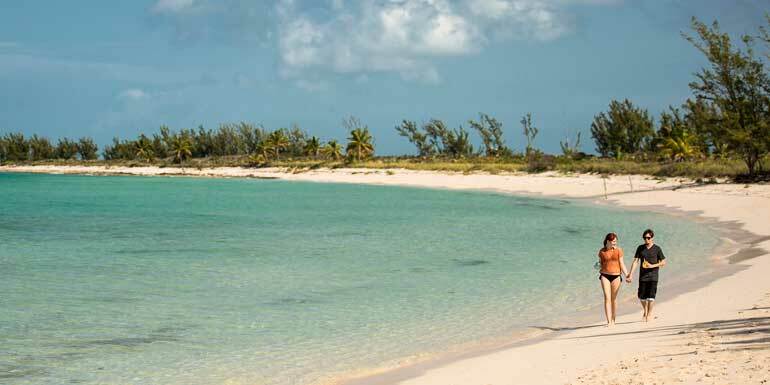 In addition, roving waiters walk the shore with buckets of water and rum punch specials for sale throughout the day. 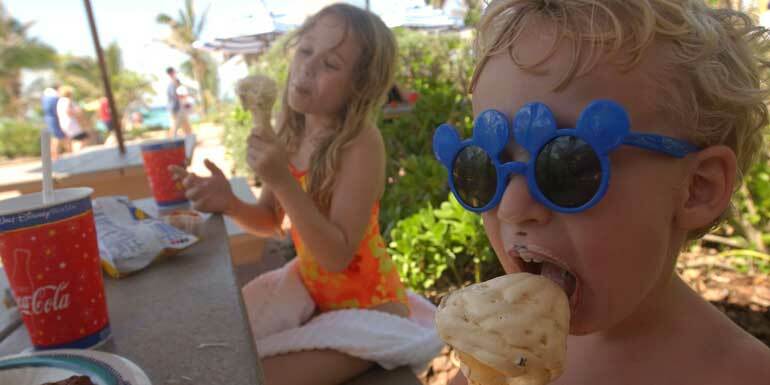 Tip: Kids melting down in the sun? 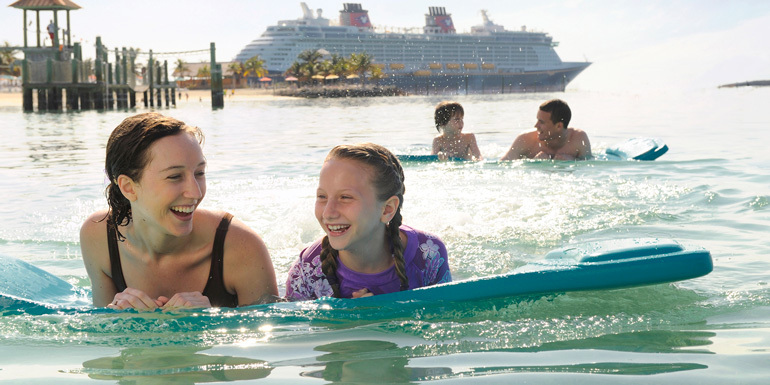 All of the onboard dining options are also open when the ship is in port at Castaway Cay, so you can always take the kids back onboard, feed them, let them have a nap, and head back out later. Marge’s Barges: Here, you can sign up for parasailing and fishing charters. 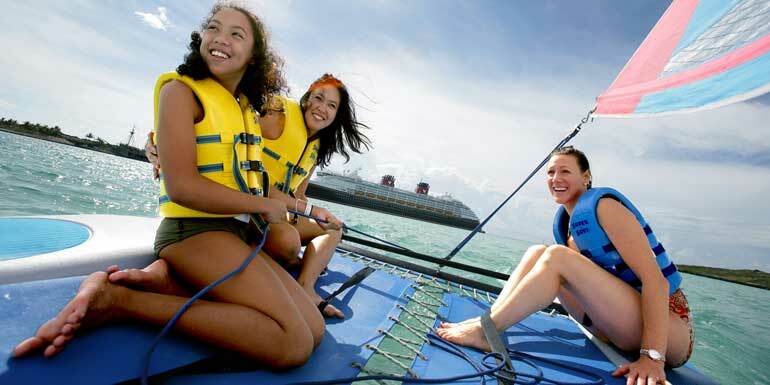 At nearby Boat Beach, you can rent watercraft (including Aqua Trikes and sea kayaks) or take hop-on, hop-off banana boat rides; you’ll also find the stingray feeding area. Beach Sports: Volleyball, tetherball, and soccer courts are set up just far enough from the sand. Gils’ Fins and Boats, Flippers n Floats, and Windsock Hut: These three shops all have snorkel and tube rentals, as well as free life vests you can borrow. Pelican Plunge: This castle-looking water slide is set far enough from the shore so that the squeals of children can’t be heard on the beach. Tip: The family beach at Pelican Point gets increasingly crowded as the day progresses. Go there at 8:30 am when the gangway opens, and you’ll have a few hours of quiet time before the throngs arrive. Spring-a-Leak: Similar to the “Finding Nemo” water park for small kids on the ships themselves, this wet play area includes a variety of fountains and sprinklers for toddlers and young children to explore. 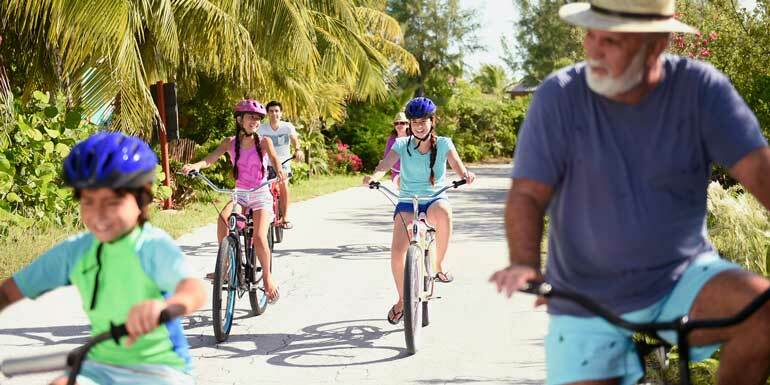 Bike Rentals: Not only can you rent bicycles to ride the same path that some passengers run a 5K on, but you can also rent a variety of sizes — including ones with training wheels and even kids’ seats for the smallest riders. 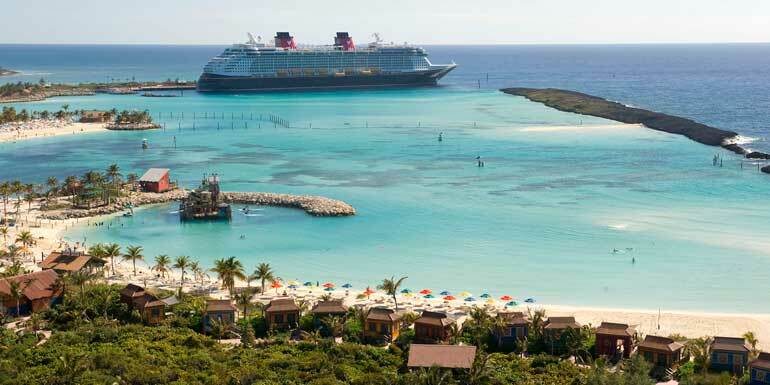 Scuttle’s Cove: Right near the first tram stop, Castaway Cay's children’s area includes supervised activities —such as sandcastle competitions and water balloon games — so that parents who want some alone time can drop off the little ones and head to the adult-only beach, called Serenity Bay, for a little while. This is also where characters, including Mickey Mouse and Goofy, make appearances throughout the day. Beach Cabanas: The cruise line rents out 20 cabanas, which — at 325 square feet each — might be bigger than your cabin. Complete with lounge chairs, a dining table, a sitting area, a fridge, a locker, towels, and sunscreen. Hide Out: This teen-only area has music as well as a private strip of beach, with lounge chairs and umbrellas just for the 14- to 17-year-olds. 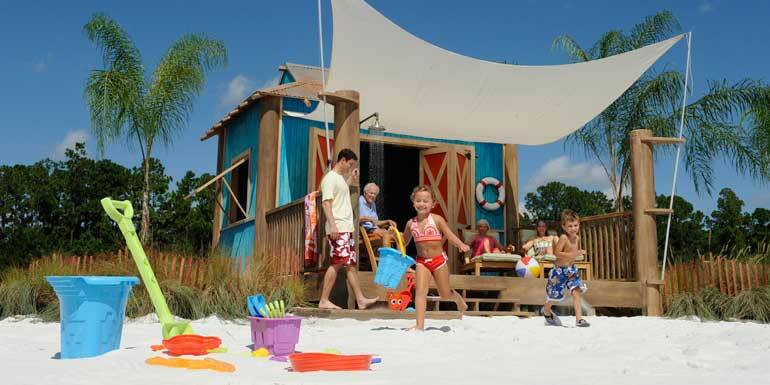 Serenity Bay: The adult-only beach on Castaway is farthest from the ship but has a tram stop to it. In addition to peace and quiet, as well as much more space, it includes a massage cabana for massages on the shore. In Da Shade: Had too much sun, or stuck with a bout of drizzle? This covered area has basketball hoops, pool tables, and pingpong tables. There are also supervisors here so that tweens (ages 11-13) can hang out without their parents. In addition, activities such as crab races take place throughout the day around the island. Tip: Don’t want to bring buckets and shovels from home? They’re available for sale at shops on the sand and, since many of them are Disney-themed (such as shovels with mouse ear-shaped handles), they can serve as souvenirs of the trip if you want to take them home. 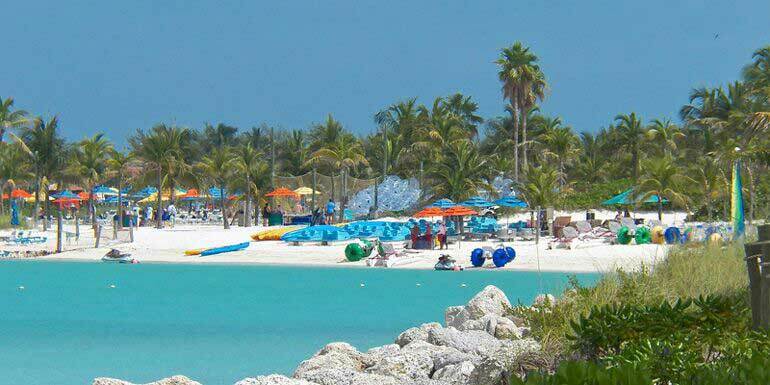 What do you like about Castaway Cay?